This sqadia medical lecture, of pharmacology course, discusses about androgens and antiandrogens. Androgenic drugs are the synthetic chemical preparations which have the role as androgen hormones in human body. These drugs include danazol, oxandrolone and many such agents. Hyperandrogenic conditions presents with many associated medical conditions like follicular atresia, arrest etc. These drugs, after being ingested, are metabolized by body. 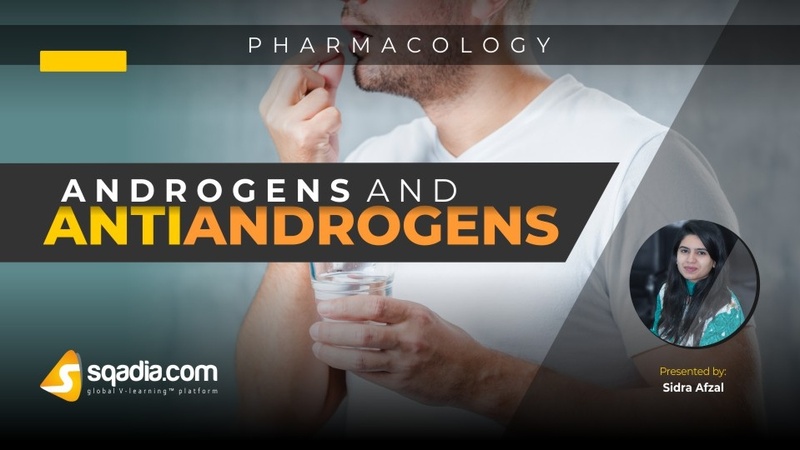 They act via androgen-specific receptors and hold certain pharmacological features. Adverse effects, however, vary with age and gender. These drugs hold their clinical significance by being employed in androgen replacement and testosterone therapies in addition to their benefits as protein substitutes and growth stimulators. Antiandrogens, as the name indicates, act in antagonism to the androgens. Each such drug has mode of action either by inhibiting steroid synthesis, conversion of precursors into androgens or obstructing receptors. 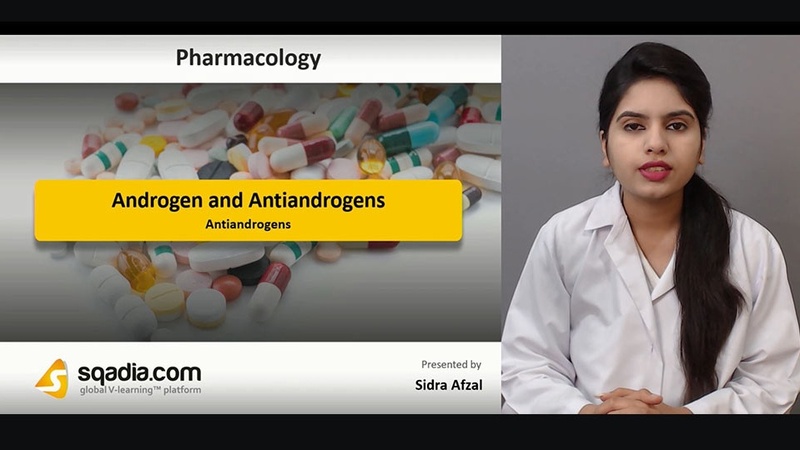 Androgens are discussed comprehensively in the medical video lecture at the platform of sqadia.com for medical and MBBS students. Androgens, themselves, are the hormones which are responsible for manly features. However, there are various synthetic androgenic steroids available in market. Some of these include oxandrolone, oxymetholone. However, there are a range of conversely acting drugs termed as antiandrogens, as is indicated from its name. Androgens have a significant physiological role, but increased amounts may lead to development of follicular atresia, arrest and oocyte adult diseases. Anabolic steroids, substances resembling testosterone, cause promotion of muscle growth and are employed to treat anemia and osteoporosis. Testosterone metabolism occurs in body and some intermediate compounds are synthesized. Synthetic steroids having similar function are methyltestosterone and fluoxymesterone. At sqadia.com, according to the medical syllabus of pharmacology course, pharmacological properties have also been conversed about under the chapter of androgens and antiandrogens. Androgens act via androgen receptors (AR/HSP). They hold certain pharmacological properties. They are readily absorbed and undergo metabolism. It has anti-inflammatory effects, increases insulin and baroreceptors sensitivity and muscle perfusion along with increase in muscle mass and strength. Despite these pros, some cons are also associated with androgens. Adverse effects vary between genders and people from different age groups. These are contraindicated in pregnant women, males with either prostrate or breast cancer and individuals with renal or cardiac disease. 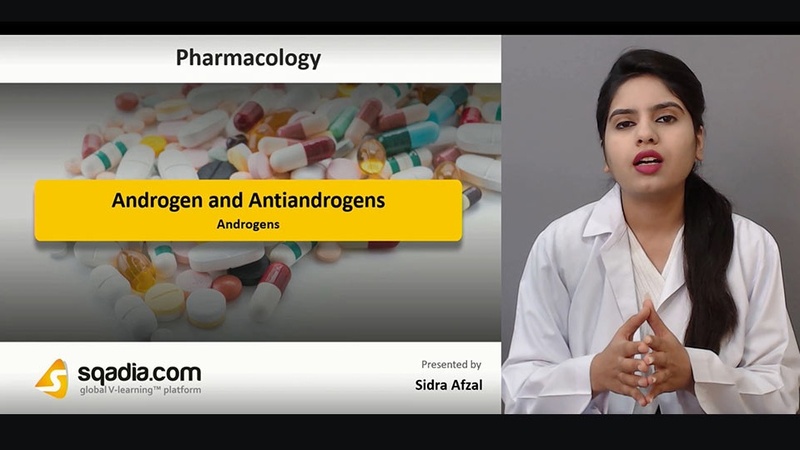 Clinical Use is discussed comprehensively in the medical video lecture at the platform of sqadia.com for medical and MBBS students Amongst the vast clinical benefits, one is the androgen replacement therapy in men in which these drugs are either orally or intramuscularly injected. They are employed to treat certain gynecologic disorders, endometriosis and are used as protein anabolic agents. They can alleviate medical conditions like anemia via recombinant erythropoietin replaced androgens and osteoporosis. These play a role as growth stimulators however; their concentration declines with age. Anabolic steroid and androgen abuse is also an observation. 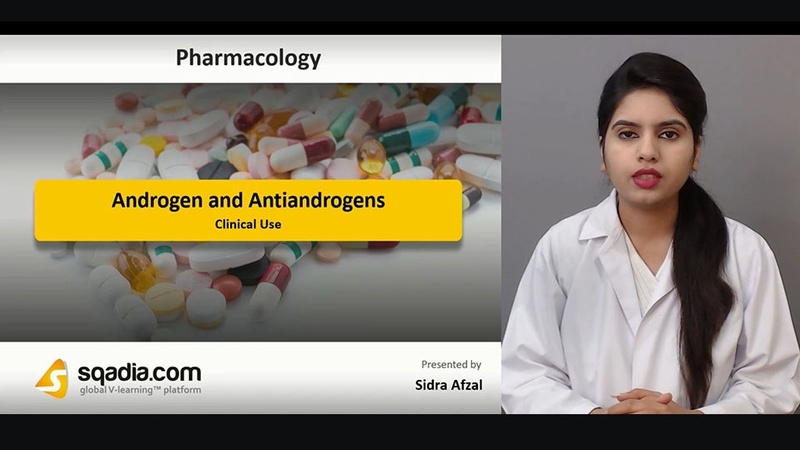 For the better understanding of medical students, in depth elaboration is given on antiandrogens. Antiandrogens are the drug agents which act as antagonists to androgens by blocking the effects of androgens. Out of commercially available antiandrogens, bicalutamide, nilutamide and finasteride are some names. Steroid synthesis inhibitors like ketoconazole inhibit the production of steroids as the name suggests. Other mode of action is the inhibition of conversion of precursors to androgens. Some of them, like abiraterone, act by receptor blockage. Gossypol is one of the contraceptives for male gender.